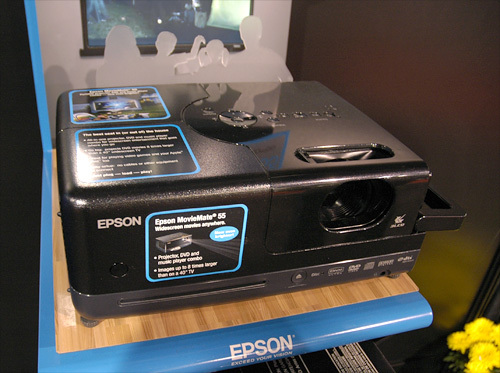 Epson MovieMate 55 Projector/DVD Player | OhGizmo! By Andrew Liszewski on 01/20/09 • Leave a comment! I tend to avoid ‘all-in-one’ devices like this because they always seem to prove the old “jack of all trades, master of none” adage. But the only reason I’d buy a projector would be for portability reasons, so having a DVD player and 8 W speakers built-in would definitely sweeten the deal. Epson was showing off their MovieMate 55 projector at their CES booth this year, and while it’s not the top-of-the-line in any category, it seems like a useful device. At 8.3 lbs is not super-light, but it can produce an image up to 150 inches in size (16:9 aspect ratio) with a brightness of about 1200 lumens. It’s also got standard video hook-ups like RCA and VGA for connecting a laptop or gaming console, though HDMI would have made things easier, particularly when it comes to hooking up a Blu-ray player since the MovieMate 55’s own DVD player doesn’t do HD. But it does support non-DVD video formats like Divx, so you can enjoy your ‘alternately acquired’ media too. And it’s available now on the Epson website for $699.99.